The Bulova B6218 Empire Desk and Table Clock is a Art-Deco-inspired clock with a Oak Veneer case finished in espresso. The rectangular classic white face has bold black Arabic numbers and black spade hands. Requires one (AA) battery (not included). The Bulova Empire has an Industry Exclusive Bluetooth®-enabled speaker system. 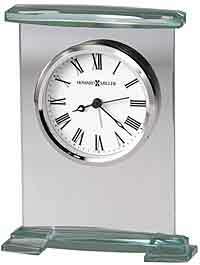 You are able to stream any type of programming from a tablet or smart phone and hear it from the clock wirelessly. It works with Android and IOS software. The Bluetooth® speaker is powered by a set of rechargeable batteries (Included). There is a USB cable and universal charger included for worldwide use. 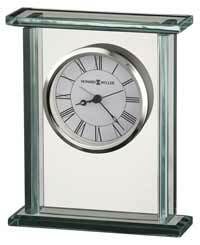 Size : H: 7", W: 6", D: 4.5"
Clocks for sale at The Clock Depot including the B6218-DS at discount prices.